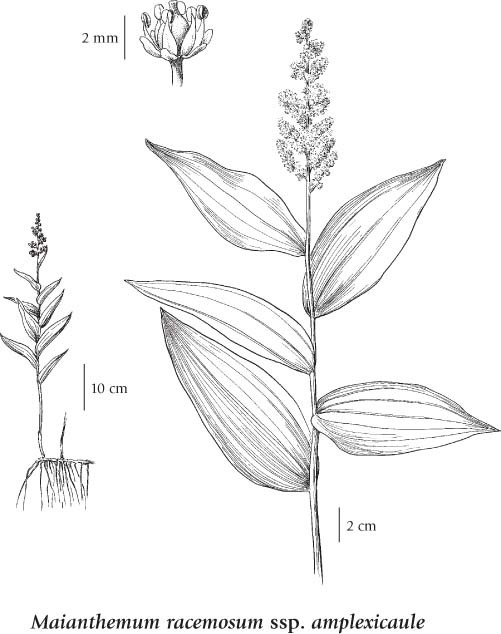 Perennial herb from a stout, fleshy, knotty, brownish rhizome; stems erect to stiffly arched-ascending, 30-100 cm tall, finely spreading-hairy above. Stem leaves 5 to 12, alternate often in two rows, oblong-elliptic to egg-shaped, tapering to a frequently clasping base, 5-20 cm long, 4-8 cm wide, unstalked or short-stalked, short stiff-hairy on undersurface, the margins entire; basal leaves lacking. Inflorescence a branched, egg- or pyramid-shaped, (3) 5- to 12-cm long, terminal cluster of numerous, spreading, short-stalked flowers; flowers white, wheel-shaped, of 6 similar, distinct tepals, the tepals 1.5-3 mm long, narrowly oblong; stamens 6, longer and wider than tepals; pistil 1, 3-chambered. Berries, globe-shaped, at first mottled green and red, eventually all red, 5-7 mm wide; seeds usually 1 or 2. Moist to mesic forests, streambanks, meadows and clearings in the lowland and steppe to subalpine zones; common throughout BC south of 56degreeN, rare northward; N to AK, E to SK and S to SD, TX, NM, AZ and CA.